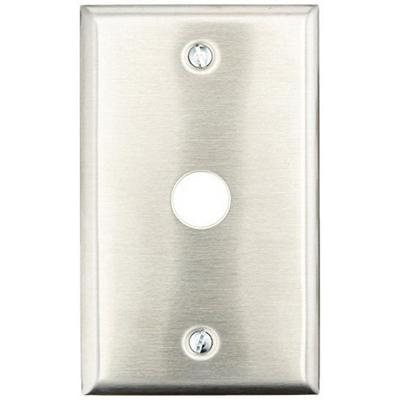 Edwards Pushbutton switch wallplate in matte finish, has stainless steel construction. It measures 2-3/4-Inch x 4-1/2-Inch. Wallplate in rectangle shape, is ideal to place in vertical orientation. This wallplate has one port switch configuration. It supports standard switch box mounting. It is suitable for mounting 620 and 690 series 5/8-Inch pushbutton switches on standard single gang box. Switch wallplate is cUL listed and NOM certified.